Gongbi or detail-oriented style paintings are still popular for the subject of hua-niao (flowers and birds) and occasionally ancient court ladies. 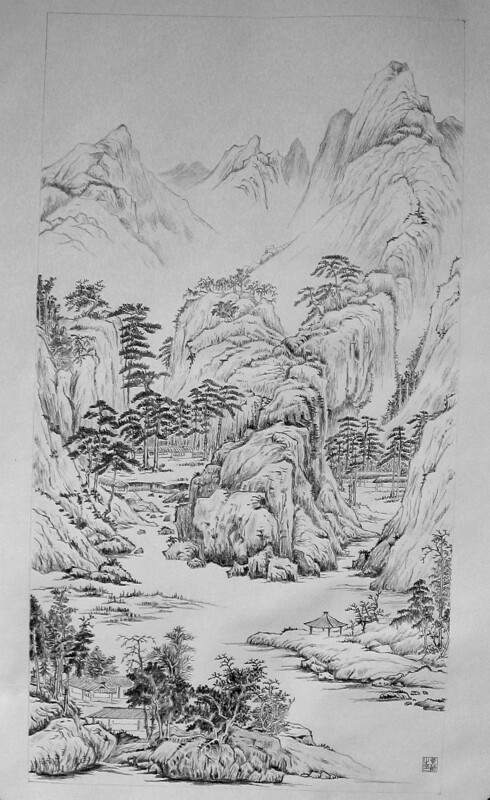 But Chinese gongbi landscape paintings are rare or nearly became extinct at the beginning of the 20th century. It's probably just a supply and demand issue. Nowadays, while landscape painters are selling fast food a.k.a xieyi paintings to make a living, non-professionals like me have no worry about making a profit, and are immune from supply and demand. 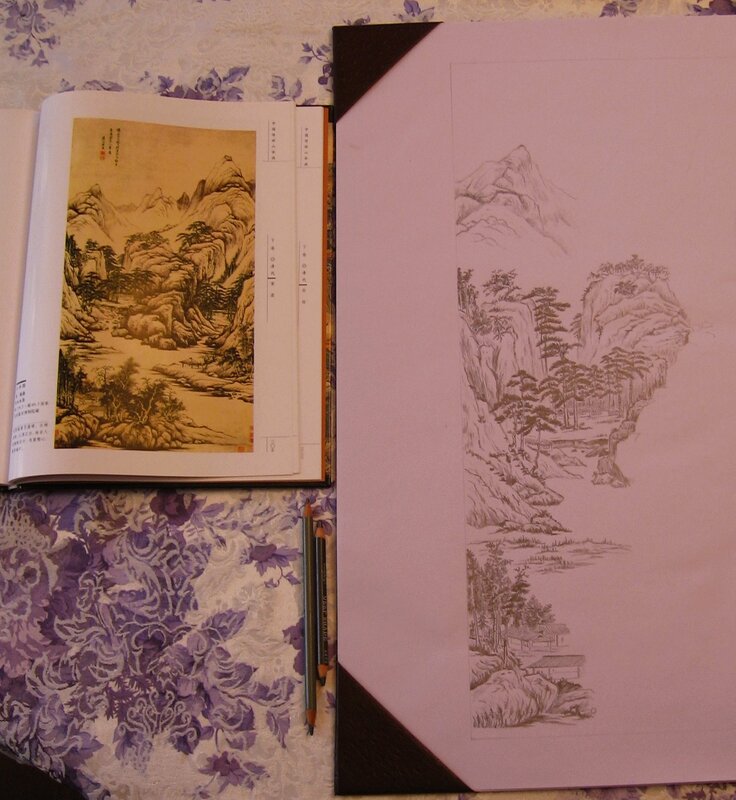 So I decided to take some time to resume my childhood hobby, linmo or replicating ancient Chinese landscape paintings. Linmo is the action of drawing the same picture by looking at another with naked eyes. It was common practice for ancient painters, including some prominent figures in history. What I do here is different, though. While I did real linmo with brushes and ink as a child, now I use pencils instead, to make it simple. 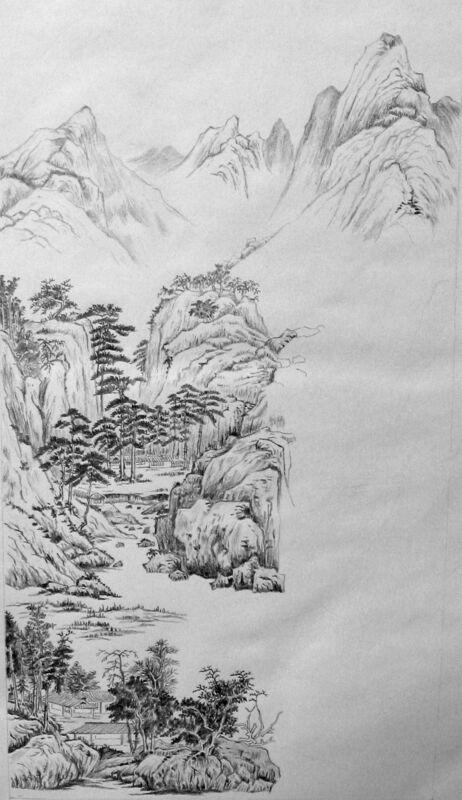 Pencils have their own challenges; they don't offer you the same capability as brushes to perform cun (pronounced tsoon), the special brush stroke technique in Chinese paintings. Instead you have to emulate it, paying special attention to thickening and thinning, darkness and lightness, of the same line. Nevertheless, pencils are ideal for a person that wants to dab at the picture for as short as a few minutes on the spur of the moment. 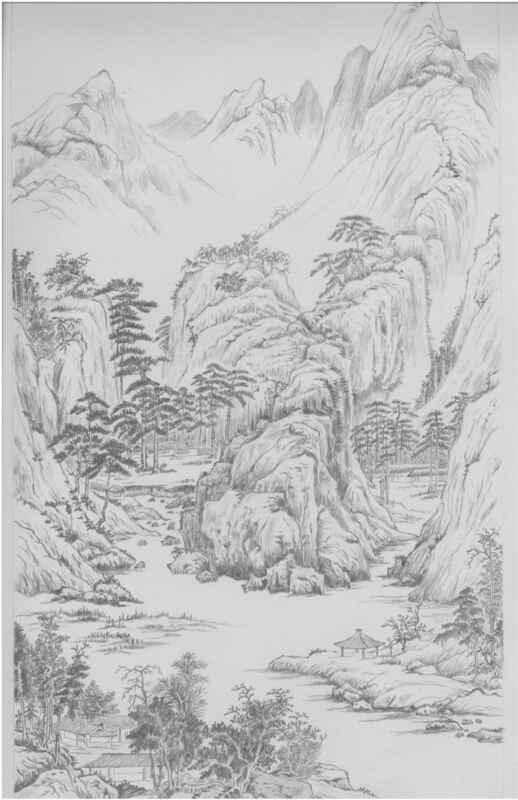 The painting on the left (click to enlarge) is my replica of the Qing dynasty painter Huang Ding's Shan Shui Tu (Picture of Mountains and Water). I thought it was moderately challenging to replicate. In 2008, I started it over the July 4th weekend and thought two hours per weekend and eight to ten hours in total would be enough. But the effort was underestimated. The photo was taken in October just after it was finished. After all, pleasure is in the journey, not at the destination. I sit at my drawing table whenever I feel like. It's an excellent mind exercise, in the midst of hectic modern life.